Christmas is around the corner, yay! My tree is up and pretty. Cookies are baked. Parties are in full swing so I'm seeing lots of friends and family. It really is the most wonderful time of year. The Christmas party I went to over this past weekend was with The Girls (check out Jenn's blog), and we went for an Italian theme -- Feast of the Seven Fishes. Sure it's normally celebrated on Christmas Eve, but hey we made it work. This time of year is about friends and family being together, right, so got that part down pat! There were mussels and baked salmon and crab dip and ceviche and a shrimp pasta and tons of cookies and desserts. 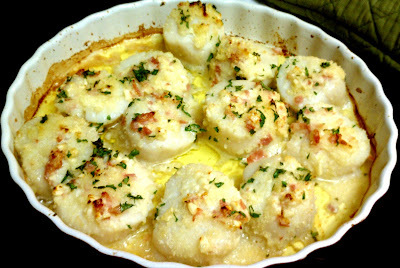 My contribution to this potluck was baked scallops, or scallops au gratin. I saw Ina Garten make it on Food Network once and finally got my chance to make it. Instead of the bay scallops Ina used, I used giant (10 per pound count) sea scallops. I didn't write down the quantities of the ingredients before I left my house for Jenn's, so I kinda winged it. I wish I'd baked a bit shorter and then broiled them longer for a crisper crust (recipe reflects that change), but it still turned out great! Preheat oven to 425. Remove the little tabby thing on the scallops (I had the guy at the fish counter do it for me), then wash and pat dry. Arrange in a baking dish. Mix together the butter, garlic, shallots, proscuitto, parsley, and lemon juice. Sprinkle some salt on it an mix again. (The proscuitto is already salty so don't get too overzealous there.) Spread evenly over the scallops. Sprinkle with the panko. Pour white wine into dish. Bake for 6-9 minutes. Turn to broil and broil another 3-5 minutes or until the tops are golden and crispy. Enjoy!